A faculty meeting with Dave Dwyer, candidate for the executive vice president for academic affairs position at the University of Evansville, is scheduled for today, Thursday, February 11, at 4:00 p.m., in the Vectren Lecture Hall, Room 100, Koch Center for Engineering and Science. You can view Dwyer’s credentials at the following website: www.evansville.edu/offices/academicaffairs/evpaaSearch.cfm. The University of Evansville will host a visit February 29 - March 2, with a team representing its regional accrediting agency, the Higher Learning Commission (HLC). The Higher Learning Commission (HLC) is the largest of the six regional accreditation agencies in the United States. It serves higher educational institutions in nineteen states stretching from Arizona to West Virginia. To make determinations about accreditation, the Commission has established the Criteria for Accreditation, standards of quality that institutions are expected to address. The Criteria emerge out of a set of guiding values that are grounded in shared tenets of the academic community. Because the standards against which UE will be evaluated are common expectations at colleges and universities, looking at our policies, practices and outcomes will be more than just an exercise in accountability. It will be an opportunity for us to respond to those things that matter both to us at UE and to the larger higher education community. The HLC’s guiding values undergird the specific criteria and requirements that UE will be expected to demonstrate. More complete explanations for each may be found in the New Criteria for Accreditation. Click here to learn more about the HLC and what to expect during the visit or follow along on social media using #HLCatUE or #myUEdegree. The Office of Fiscal Affairs will be issuing Form 1095-C to employees in the coming weeks. If you wish to ensure the quickest delivery of this form, please log on to WebAdvisor and provide consent to receive the form in the electronic format. Consent for that option must be provided no later than the end of the business day on Friday, Feb. 12. Log on to WebAdvisor and select the option Employee Self Service. Click the option 1095-C Information. Click the Change Preferences button. Click the first radio button to give your consent. You will not receive a paper 1095-C in the mail if you select the electronic option. This form will be used to complete questions regarding health insurance offers and coverage on your 2015 personal tax return. The Office of Development and Alumni Relations would love to invite faculty members and staff to the Atrium, Koch Center for Engineering and Science, for Valentine cookie decorating at this month's pop-up event, happening TODAY, Thursday, February 11, 2:00-3:30 p.m.
Do you love Harlaxton? If you do, why not make her your Valentine? Come by our table in Ridgway University Center today from 11:00 a.m. – 1:00 p.m. and write a Valentine to Harlaxton. Then come celebrate on February 12 from 11:00 a.m. - 2:00 p.m. in Dunigan Lounge in the Schroeder School of Business Building. The Phi Alpha Delta Pre-Law fraternity dessert sale is back this Friday! We will be selling cake pops and 4-layer brownies for $3.50 a piece in Ridgway University Center from 11:00 a.m. - 1:00 p.m. and 5:00 - 7:00 p.m. Cash and credit cards accepted. A portion of our proceeds will benefit the Flint Water Fund. 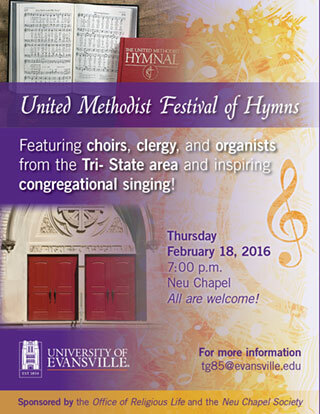 Mark your calendars and plan now to attend the Festival of Hymns on Thursday, February 18, at 7:00 p.m. in Neu Chapel. The campus community is invited to the ecumenical festival, which is intended to encourage and inspire congregational singing. Choirs, clergy, and musicians from the local area and campus community will lead the collaborative effort. Hymns with brass, wind, and keyboard instruments, including the harpsichord, pipe organ, and piano, will lead us through the Christian year as we celebrate our heritage and anticipate a bright future. All those who love to "sing lustily and with good courage” will be especially interested in the festival. We hope everyone will experience a meaningful evening with an opportunity to find new energy for singing the great hymns. The event is tied to the University’s Founders Day celebration on Sunday, February 21, and celebrates UE’s Methodist heritage, but the Festival of Hymns is an ecumenical, community-wide event. All are welcome! We expect over 100 employers for Career Day 2016! Looking for a full-time professional position? Cooperative education opportunity? Internship? Summer job? Then make plans to attend Career Day on Tuesday, February 23, 11:00 a.m.– 2:00 p.m., Carson Center, Meeks Family Court. See registered employers in JobLink (evansville-csm.symplicity.com/). Also, pre-register for the event in JobLink to allow employers to view your resume early! Huge career fair in Indy! Register today for Collegiate Career Expo. The career fair is next week on February 18. There are 130 employers expected, and they would love to meet UE students. You don't even have to drive! The University of Evansville will provide bus transportation. A $10 required deposit is refundable upon attendance. Reserve your seat now (www.evansville.edu/careercenter/busReservationForm.cfm). Need assistance with your job, internship, co-op, or graduate school search? Please contact the Center for Career Development: career@evansville.edu or 812-488-1083. Why celebrate Founders Day in February? Founders Day will be celebrated this year on Sunday, February 21, at 10:30 a.m. in Neu Chapel. 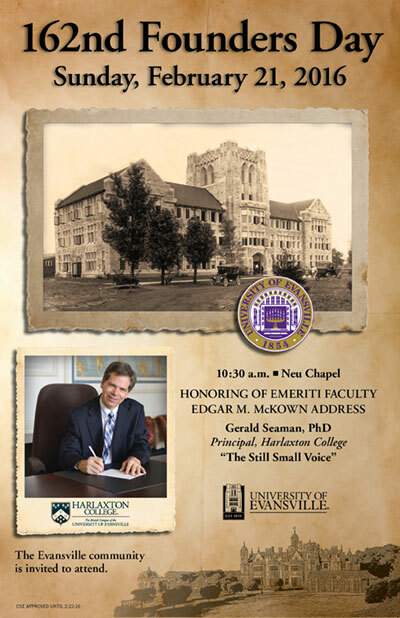 Founders Day ceremonies are held in observance of four important events in the history of the University of Evansville. On February 8, 1810, John C. Moore, founder of Moores Hill College, was born. In addition to contributing $3,000 and 12 acres to the school, Moore personally paid the school’s deficits until his death in 1871. The story of the University of Evansville began 158 years ago on February 10, 1854, when Moores Hill Male and Female Collegiate Institute was incorporated. This fledgling institution was located in Moores Hill in Dearborn County, about 40 miles west of Cincinnati. On February 17, 1919, the school was relocated and Evansville College was incorporated. The College achieved its first major academic goal in 1931 by winning accreditation from the North Central Association of Colleges and Secondary Schools. Rapid growth and years of dedication to meeting the area’s higher education requirements were recognized by the state legislature’s action in renaming the school. On February 17, 1967, the University of Evansville was incorporated. Do you want to gain valuable leadership skills? Then sign up for the annual L2L Leadership Conference planned for February 27. This year's conference title is "Declare Your Leadership," and it's all about how to communicate as a leader. You'll also get donut holes, lunch, and a free T-shirt! The conference begins at 10:00 a.m. and ends at 3:00 p.m. Sign-in starts at 9:30 a.m.
A $10 deposit is required, but it will be returned at the end of the conference. The deposit can be given to Megan Sicard in the Office of Cultural Engagement and International Services in Ridgway University Center. Don't miss this opportunity! Sign-ups end tomorrow, February 12, at midnight. You can find the registration form here. The Student Activities Board has changed the start time for Saturday’s “Ball in the House” evening of a capella event to 7:00 p.m. Come out and enjoy the show! More Road Trip hosts needed! Due to high interest in Road Trip, more hosts are needed! If you live in the residence halls, please volunteer to host! In addition to the snazzy Road Trip T-shirt, Honors points and volunteer hours are being awarded to Road Trip hosts this year. Sign up online: acelink.evansville.edu/forms/admission/RoadTripAssistance.cfm or pick up a paper hosting form in the Office of Admission, Room 104, Olmsted Administration Hall. Please contact Ashley Ross (aj53@evansville or 812-488-1144) or Jonathan Kelly (jk115@evansville.edu or 812-488-2108) with any questions. Thank you to all who host! There are jobs available through federal work-study offered by the Office of Financial Aid for UE students. Eligibility is based on federal need as shown through the FAFSA. You can go here to find the application. Applications may also be obtained at the UE Office of Financial Aid, in Room 116, Olmsted Administration Hall. Questions regarding eligibility and job availability should be directed to Catherine Carver at cc204@evansville.edu. The Office of Education Abroad is accepting applications for the upcoming Jezreel Expedition in Israel. This study abroad opportunity is open to students of all majors. The priority application deadline is Monday, February 15. For more information about program dates and charges, or to submit an online application, please visit: www.evansville.edu/studyabroad/shortTerm.cfm. For additional information, please contact Marissa Mitchell, program coordinator, at mm353@evansville.edu or ext. 2039. Crescent Magazine is soliciting students' opinions about Sodexo, UE's food service provider, as it explores areas to be included in a news story for its April issue. All answers are anonymous. Go here to complete the survey! File the 2016-17 FAFSA by March 10 at www.fafsa.gov. Continuing students should file the 2016-17 Free Application for Federal Student Aid (FAFSA) to apply for federal, state, and University need-based financial aid, including all federal student loans. UE's FAFSA code is 001795. Also, you are no longer able to use your PIN to log in to the FAFSA. Instead, both students and parents are each required to have a FSA ID. Go to fsaid.ed.gov to create a FSA ID before attempting to complete the FAFSA. Filing by March 10 is essential for Indiana residents, and highly recommended for all. Questions regarding the FAFSA should be directed to the Office of Financial Aid, Olmsted Administration Hall, Room 116, at 812-488-2364, 800-424-8634, or financialaid@evansville.edu. The IRS Data Retrieval Tool transfers parent and/or student IRS tax information to the FAFSA. The IRS Data Retrieval Tool is available through the FAFSA approximately three weeks after the 2015 federal tax return is filed electronically. IRS Data Retrieval can be used for the initial FAFSA or to correct estimated tax information on a submitted FAFSA. This is a reminder that the United States Postal Service will be closed in observance of President’s Day, Monday, February 15. Please note that UE will not be able to pick up mail from USPS that day, since the Post Office will be closed. Any mail picked up from UE areas by Mail Services on that day will be metered and mailed on the afternoon of Tuesday, February 16. For mailing questions, contact Mail Services at ext. 2197. Robert Dion, associate professor of political science, was recently interviewed by Brad Byrd during Channel 25's In-Depth segment. Dion discussed the Iowa Caucuses and the 2016 presidential race. To listen to the interview, go here. University of Evansville head softball coach Mat Mundell is ready to begin his second season at the helm of the Purple Aces as the squad will open the season on Friday at the Trojan Invite. Evansville opens up the tournament with a pair of games on Friday and two more on Saturday before one contest on Sunday. The Aces first game at the event will be on Friday morning at 11:00 a.m. versus Eastern Michigan. February 12 at 11:00 a.m.: vs. Eastern Michigan. February12 at 2:00 p.m.: vs. Alabama State. Leading the way into the 2016 campaign is Danielle Freeman, who earned a spot on the All-MVC Preseason Team. A Second Team All-MVC player a season ago, Freeman led the Aces with a .339 batting average and sat atop the conference, slugging .723. Playing in just 35 out of 55 games due to her commitments to the UE swim team, Freeman recorded 13 home runs, finishing third in the conference. Also earning conference accolades last season was Morgan Lambert. In her redshirt freshman season, Lambert garnered MVC All-Defensive Team honors as she played in 51 games while making 46 starts primarily at first base. She finished the season with a .980 fielding percentage and made just five errors over the course of the season. Michal Luckett and Chandra Parr are also two of the top returning offensive forces for UE. Luckett was second on the team with a .311 average in 2015. She finished in a tie for third on the Aces with 21 runs scored. Parr batted .297 while finishing second on the squad with nine home runs and third with 23 runs batted in. The stakes are getting high as we move to the stretch run of the season as the University of Evansville Men’s Basketball team welcomes Illinois State to the Ford Center in a battle for second place in the Missouri Valley Conference. Both squads enter the game with identical 8-4 conference marks and will battle it out for sole possession of the #2 spot in the league in an 8:00 p.m. game that will be carried live on the CBS Sports Network. In Saturday's game against Missouri State at the Ford Center, Evansville scored the first three and never trailed, boasting a final of 83-64. Jaylon Brown led Evansville with 19 points, tying his career high. He connected on three of his five 3-point attempts and all four free throws in the win. D.J. Balentine scored 18 points, all in the second half, to break Colt Ryan’s program scoring mark; Balentine now has 2,280 in his career. Willie Wiley totaled eight points over 15 minutes of play as he hit four out of five free throws. There is a new scoring leader in University of Evansville history - D.J. Balentine. With 18 points against the Bears, Balentine passed Colt Ryan’s mark of 2,279 points. Balentine now has 2,280 points in his career, which has seen him play 130 games. The senior has moved into 6th in MVC history and 13th in Indiana Division I basketball history. Should D.J. Balentine lead the MVC in scoring again, the Aces will have had the leading scorer in the league in four of the last eight years; Balentine will have led three years in a row while Shy Ely led the Valley in 2008-09. It would also make UE have a top two scorer in the league in seven out of eight seasons and a top three scorer in all 8 years. If Egidijus Mockevicius can keep his average of 14 rebounds, he would be the first since Xavier McDaniel of Wichita State to average that many; McDaniel notched 14.8 per game in 1985. The last MVC player to average at least 10 boards was Joe Breakenridge of UNI, who had 10.5/game in 2001. Mockevicius currently stands at 350 rebounds this season, he is just 20 away from moving into a tie for 36th in MVC history. Wes Unseld holds the single-season rebounding mark with 533 in 1966-67 while the last players to make the top 36 list were Xavier McDaniel and Benoit Benjamin (Creighton), who each had 451 in 1984-85. On the heels of a 58-53 home win over Wichita State, Illinois State heads to Evansville with a 14-11 overall mark and 8-4 in Missouri Valley Conference play. Since falling to the Purple Aces on January 15, Illinois State has won five out of their last six games. DeVaughn Akoon-Purcell is the leading scorer for the Redbirds, averaging 14.6 points per game; he is second on the squad with five rebounds. MiKyle McIntosh has notched 11.1 points while Deontae Hawkins (10.6) and Paris Lee (10.5) also average double figures. In the win over the Shockers, Lee posted 19 points while Hawkins finished with 14 points and 10 rebounds. One of the true legends in University of Evansville athletics history will be recognized for his service to the school as Jim Byers will be honored at the Men’s Basketball game against Southern Illinois, on February 20. The former UE administrator will be recognized with a proclamation by Evansville mayor Lloyd Winnecke prior to the February 20 game while a video presentation will be played at halftime. All former UE student-athletes are invited back to the game to honor Byers and tickets for them are available for just $5 through the alumni office. Byers served in several capacities with the Purple Aces, including head football coach and athletics director. Since retiring in the late 1990s, he has remained active in supporting the department and all of its sports.